The Burrard Inlet is a damn good reason to say “No” to the Kinder Morgan pipeline expansion. It’s our living room, meeting place, our Malecón and public square. 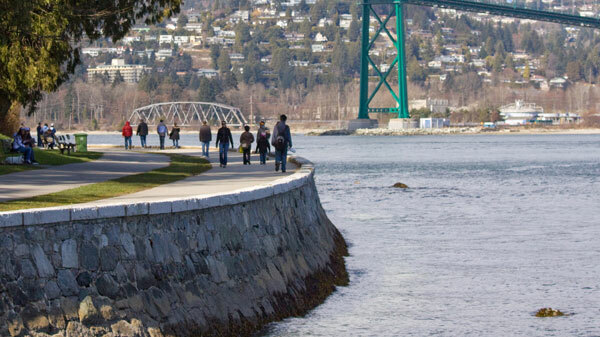 Whenever our Premier (or PM) crave something “world class,” we recommend Vancouver’s Seaside Greenway, which includes the Stanley Park Seawall. As the planet’s longest, uninterrupted waterfront path, it’s one of humanity’s most inspiring Commons. Awe-inspiring, priceless and free, experiencing it does one a world of good. But it’s never free from threat, much like many irreplaceable regions – the Peace, Prince Rupert and Haida Gwaii, Howe Sound, the once-mighty Fraser – and too many places where Clark recklessly proposes deadly fossil-fuel mega-projects. One has to wonder why anyone would risk screwing up, as the world embraces cheaper, renewable options and better jobs. Long walks through sacred spots – in ‘our moccasins,’ work boots or flip-flops – should be leadership prerequisites. Contemplate before judging those who Christy calls the “Voices of No.” See clearly why her “Path to Yes” is the wrong direction and a sacrilege. Disagree? Well, the Burrard Inlet is a damn good reason to say “No.” It’s our living room, meeting place, our Malecón and public square. It’s the stage for Vancouver’s 40th Annual Folk Festival and boasts championship fireworks, decades of polar bear swims, carolling ships and the Kit’s Showboat. Our outdoor rec room for beach volleyball, picnics or just chilling out, where a glimpse of one of 80 endangered orcas – our NHL team logo – is as thrilling as any overtime goal. I count the freighters constantly at anchor in the port (a raison d’etre for Confederation). Fifteen, 20, more? Start at the head of the Kinder Morgan/Trudeau Black Snake. Christy says it’s now safe to triple pipeline-terminal capacity and increase tanker traffic seven-fold. All converging at the foot of a mountain and major university in a seismic zone. Yet someday, somehow, greenhouse gases will be cut. Highly unlikely (or is it Notley). The Burnaby Fire Department reports, it’s “…not the appropriate location for expansion…” noting, “…significant constraints to emergency/fire response, including safety and effectiveness of firefighters, evacuation, sulphur based gases, toxic smoke plumes and property protection.” Wise advice, recalling 2007 when the existing pipeline ruptured, spewing sludge 40 feet in the air, covering homes, trees and wildlife. It dumped 78,000 litres of crude and poisoned 15,000m of shoreline, requiring the evacuation of more than 220 residents. Over four hundred Aframax tankers have been approved annually, each 245m long, 100m longer than the Spirit of Vancouver Island ferry at 167m. Longer than Vancouver’s tallest building, the Living Shangri La (200m). Try fathoming that between an index finger and thumb. Other structural landmark comparisons include the ever-enlarging Alberta tarsands footprint, now the size of Florida. In Calgary, where many cheer the approval of more pipelines, the Husky Tower is only 191m tall, compared to the length of an Aframax tanker (245m). South of the border, outraged resistance rapidly grows in the shadows of the Seattle Space Needle, 60m shorter (184m). The tankers’ huge mass, inertia and steering difficulty necessitate three tugs, a turning diameter of 2km, and 15 minutes to stop. Depth and beam restrictions restrict their travel to daylight hours and they must have a minimum one-mile-visibility, at a maximum six knots, at high tide, with a volume capacity of maximum 80 percent. They sit 13-metres deep, perilously close – 1.5m – to the prescribed maximum draft. Double-hulls, despite Rachel Notley’s assurances, are little comfort, having breached elsewhere. The possibility conjures up the nightmarish collapse during construction of the Second Narrows Bridge on June 17, 1958, indelibly etched in the minds of those alive then; 19 workers plunged 30m (100 ft) to their deaths. In honour of the lives lost, it was named Ironworkers Memorial Bridge. Now, the cargo: dilbit. Short for bitumen (asphalt) diluted with petro-products to enable pipeline flow. The exact mix of ingredients is an unexamined trade secret, but tankers hold 30 Olympic-size pools of highly corrosive toxins that sink, unrecoverable, in inevitable spills. “New approvals are problematic… bordering on irresponsible,” says Wendy Palen from SFU’s Biological Sciences. From universities across North America, she’s just one author of new peer research of more than 9,000 studies. Their conclusion: claims that a spill can be effectively cleaned up or mitigated are unfounded. No ocean-based studies exist of how dilbit behaves in marine environments, rough seas and changing temperatures. Christy? Justin? “World leading” science? Is Trudeau’s promised $1.5 billion taxpayer-funded response and recovery a deceitful fantasy? “Permission granted” is a surprise to disapproving mayors and First Nations. Two-thirds of those along the 1,150-kilometre route also disagree; 120 nations from both sides of the border drafted a Treaty Alliance Against Tarsands Expansion. As Trudeau/Clark “conditions” are studied – carefully, this time – numerous court cases are prepared. This shortsighted, national economic fix is just that: a quick shot-in-the-arm for oil addiction, from stranded assets. From the tens of thousands of jobs promised – mere mumbo-jumbo – 50 permanent may materialize. Millions of dollars for the Canadian economy boast foreign owners, who would turn a barely contained trickle through Canada’s third largest city into their very own gusher, shipped through the Georgia and Juan de Fuca Straits to foreign markets. From the seawall – built to buffer, but also to enjoy, nature – their deal resembles the long-ago sale of Manhattan for $24 in beads and trinkets when public land, like air and water, wasn’t considered saleable by native inhabitants. A decade ago, a storm devastated Stanley Park. Now, oceans and winds are rising. To risk people’s livelihoods for something that few people (customers) want is way, way too risky. Especially since Trump has approved Keystone XL. In 1986, I wrote a feature for the Province entitled, “Miles of sea and sand.” I had the incredible experience of talking to folks at many of our beautiful beaches – Wreck Beach, Spanish Banks, Locarno, Jericho, English Bay, Ambleside, Dundarave, Eagle Harbour and Whytecliff. Over and over, people expressed the importance of these landmarks in their everyday lives. For me, these conversations are as memorable and transforming as Expo 86. Some people know the price of everything, but the value of nothing. With all due – but decreasing – respect, take a hike! Poll after reliable poll shows that the majority of people in BC oppose the Christy Clark/Justin Trudeau fossil fuel mega-projects, as much as two-to-one. The 1% who have pocketed, and hidden, half of the world’s wealth are delighted by people who think nothing will ever change. In that context, mere optimism is a political act. So, too, is pessimism; acquiescence is one form of obedience. To look at the myriad difficult problems facing humanity directly in the eye, as challenges and opportunities to create a better world to leave to our grandchildren, is somewhat radical in these dark times. Some say we are in a tomb; others think of it as a womb and suggest we breathe and push. One bright light to follow in our ongoing global rebirth is Stewart Phillip, Grand Chief of the Union of BC Indian Chiefs (UBCIC), afnd spokesperson for the international Treaty Alliance Against Tar Sands Expansion. Another person to pay attention to and support is the seemingly indefatigable Shirley Samples whose non-stop posts reached some 20,000 followers on two Facebook pages: “Stop Kinder Morgan” and “We Love This Coast.” Her posts are a clearinghouse of current news and opportunities to fight back. It is past time to do more than just share information, sign petitions and hit send. Show up and donate as well. Poll after reliable poll shows that a majority in BC oppose the Christy Clark/Justin Trudeau fossil fuel mega-projects, as much as two-to-one. Here are just some of the organizations to look up on the Internet: Sierra Club of BC, Greenpeace, STAND (previously ForestEthics), Dogwood Initiative, Georgia Strait Alliance, Western Canada Wilderness Committee, Living Oceans Society, Raincoast Conservation Foundation and the Council of Canadians, as well as smaller grassroots groups such as BROKE (Burnaby Residents Opposing Kinder-Morgan Expansion) and NOPE (North and West Vancouverites Opposed to Pipeline Expansion). What should we the people be doing to stop this from happening and change the system that seems to support greed over planet? I’m with you on this, Bruce. Keep it up!